The passing of an extraordinary clause in a fairly ordinary law in February 2005 provided the moment from which Claire Eldridge interrogated how the identity of the pied-noir community has been shaped in the public sphere. Article 4 of that law laid a provision for teachers to educate students about the positive legacies of French colonialism. Needless to say, it was met with a wall of protest, which feared a whitewashing of France’s difficult past. Talking about memory, and framing narratives of collective memory in this way, has provided a definitional activity for the pied-noir community, which has felt aggrieved and victimised since the declaration of Algerian Independence that followed the Evian Accords in 1962. The consistency of their narrative, and their long-running mobilization has amplified their voice since the end of empire, as outlined in Eldridge’s prize-winning From empire to exile: History and memory within the pied-noir and harki communities, 1962–2012. Eldridge demonstrated how the trauma of relocation framed that narrative of victimhood, and how the choice of ‘the suitcase or the coffin’ left a long legacy. The chaotic flight of an unexpectedly large number of former colonists back to France overwhelmed the resources provided by the state, while the perceived hostility from the Metropolitan population (who viewed them as complicit in a savage and bloody war) entrenched a sense of victimhood among the community. With imported old prejudices bubbling alongside new grievances, the political voice of the pied-noir community was tied to a positive memory of empire that perpetuated the forgetfulness implied by Article 4 of the aforementioned law. 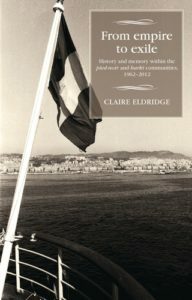 Eldridge described how associational culture attempted to reframe a lost ‘pays natal’, physically dwelling in France yet emotionally dwelling in a lost French Algeria. Meetings and conferences of pieds-noirs, one of the largest of which was held in Nice in 1987, made a strong impression on national political culture. The state’s attempts to provide pensions and benefits to appease pieds-noirs – trying to forget their ‘difference’ as part of a broader colonial amnesia – only strengthened the community’s sense that they had to tell their own story. This was played out time and again in monuments, meetings, and memorials. The state’s ad hoc commemoration policies created spaces in which well-organised pied noir associations could campaign. Further, the creation of records centres, such as the recently opened Centre des documentation des Français d’Algérie in Perpignan, were explicit efforts to set that story down indelibly.